Sister Miriam de Chantel Scott, S.S.J. 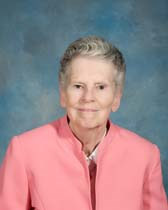 St. Joseph Sister Miriam de Chantal Scott, 82, died Dec. 6 at St. Joseph Villa in Flourtown. She was in the 61st year of her religious life. Born in Philadelphia, Sister Miriam was the daughter of William Joseph Scott and Adelaide Moore and the sister of William and the late Charles Scott. She attended St. Helena Elementary School, Little Flower High School and Chestnut Hill College. Sister Miriam entered the Congregation of the Sisters of St. Joseph on Sept. 10, 1952 and professed final vows on Aug. 15, 1960. She taught in the Archdioceses of Philadelphia and Washington and the Diocese of Wilmington. Sister Miriam also served as an office staff member at St. John Chrysostom School in Wallingford and as school secretary at Holy Cross Elementary School. In September 1998, she continued her ministry as clerical support staff/receptionist at Mount St. Joseph Convent in Chestnut Hill. Sister Miriam became a resident of St. Joseph Villa in 2008 where she remained until the time of her death. Her Mass of Christian Burial was celebrated Dec. 11 at St Joseph Villa. Sister Miriam is survived by her brother, William, nieces, nephews, and members of the Sisters of St. Joseph.